As some of you know, I’ve been struggling with the notion of Christmas/no Christmas. I like Keith’s thoughts on the matter. I especially like how he goes out of his way to keep Christians from feeling condemned. Good article! It’s getting close to that time of the year, here in America, where almost everyone celebrates the Christmas holiday in some form or another. Even people who are not Christians celebrate Christmas. My goal of this post is not to “debunk” Christmas or tell you that it’s wrong to celebrate it. 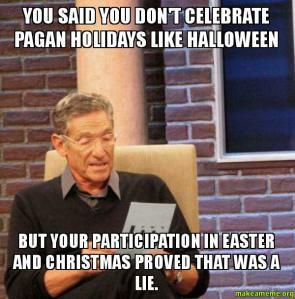 I am not going to cite a myriad of historical references alluding to the pagan influences of Christmas. Yes, there are some pagan influences, but most accusations are baseless and junk scholarship.